In 2015, the leader of one of Nielsen’s biggest businesses approached one of the company’s HR leaders with a big question: do you know why people are leaving my team? “Attrition is high—something’s going on. I feel it, I see it, I’m losing my associates,” she told Piyush Mathur, the head of the company’s brand new “people analytics” program. Around the same time, Mathur and his team were trying to put hard data behind that very problem after finding that company-wide attrition had been rising. They set out to build a basic model to answer what was causing it. The irony of it all is that even though Nielsen is known for its expertise in Big Data, it hadn’t focused on analyzing its own employees until 2015. And the results—from just a few key initiatives shared by Mathur and Nielsen technologist Doug Shagam at Talent Connect 2016—are impressive. 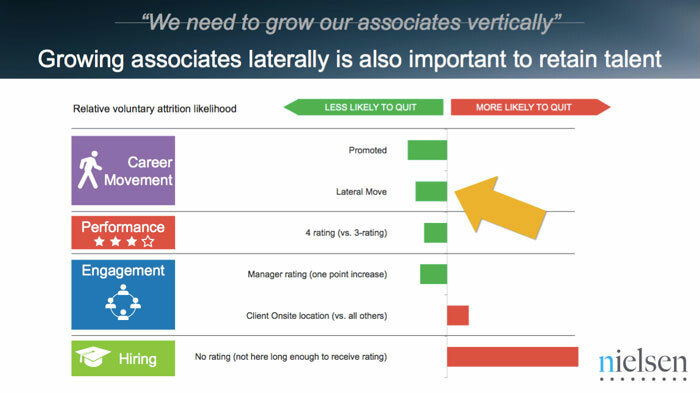 Within months, the team was able to identify the primary drivers of voluntary attrition. Nielsen has since slashed regrettable voluntary attrition by nearly half - which in turn saved them millions of dollars. For HR and talent acquisition teams looking to start a people analytics program of their own, Mathur and Shagam offer a simple roadmap. Read on for their recommendations. 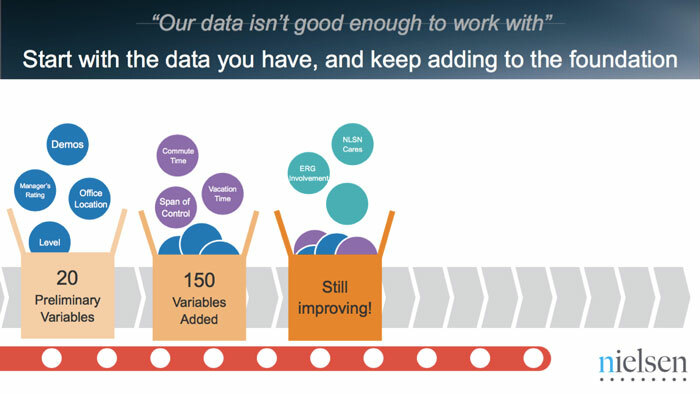 When thinking about what data you want, it’s easy to get quickly overwhelmed. Mathur and Shagam faced the same dilemma, wondering if they should do a network analysis of influencers at their company or build a really great dashboard full of interesting metrics. But soon they came to a principle that would become the driving focus of their practice: “If you’re not answering a really critical business question, [it’s] not worth doing,” Shagam says. Their main target became preventing attrition. First, they had to find a relatively simple model for measuring and predicting it; then, it was about putting in place programs to fix it; and finally, they had to measure their impact and share the results with executives in a compelling way. 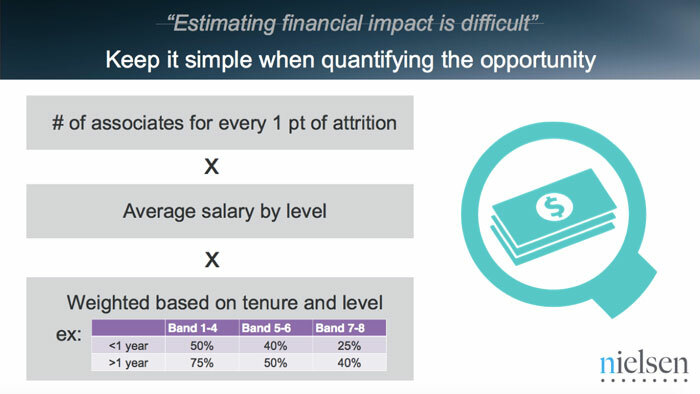 To predict future attrition, instead of spending half a year tracking down perfect data, Nielsen built a model with 20 simple points of employee data like age, gender, tenure and manager rating. They’ve refined the model over time to include data like commute time and participation in CSR programs. The first year matters most. If employees don’t even reach it to their first performance review, their likelihood of leaving rose exponentially. Though getting promoted pushes employees to stay, so do lateral moves – in a “pretty significant way,” Shagam says. HR is often in the habit of delivering insights to other departments and saying “now our part is over,” Mathur says. But he soon realized that these insights would be meaningless without action. “We have to continue this journey, be involved in the implementation…And we have to measure the outcomes,” Mathur adds. His team helped set up numerous programs to reduce attrition. After identifying attributes of associates with the strongest likelihood of leaving the company within the next six months, company leaders set up chats with the highest flight-risk employees. The result? 40% of the group was transferred to new roles. Nielsen also set up a program called “Golden Year,” which closely tracks an associate’s first year, the most dangerous time for losing an employee, and “Ready to Rotate,” a group that empowers employees to seek new roles at Nielsen, since Mathur’s team found that making a lateral move increases an associate’s chance of staying with the company by 48%. The team focuses on a few other people analytics projects, too. One tries to increase women in leadership roles from the current 34% to reflect the nearly 50% representation within the company. Another is Strategic Workforce Planning, which aims to ensure Nielsen retains employees with the skills needed for the jobs of today and tomorrow. Yet another analyzes if they’re hiring from the right universities, and which universities are successful at feeding talent to particular business functions. Nielsen has over 40,000 employees and Mathur is the only person in charge of People Analytics. With competing demands on time and resources, he has found frugal ways to make it all work. Early on, he asked other employees of several Nielsen businesses to see if they wanted to “up their analytics skills,” and that became a group of 12 employees with the passion to take charge of projects in their departments. One year later that group rose to 67 people, with staff coming not only from HR teams but finance, commercial, corporate, and IT. Finally, to build a people analytics program with impact, you’ve got to tell a rousing story to executives. 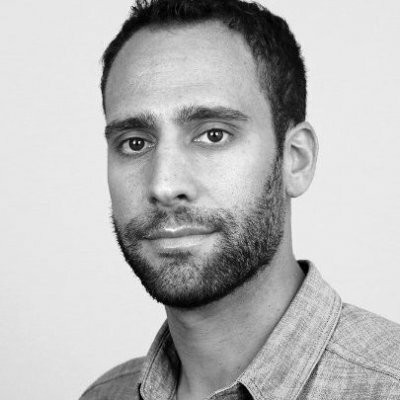 “Conveying that information in a really simple way, to certain audiences, and giving people access to the data, is very, very helpful in communicating that message,” Shagam says. Mathur recommends finding an allegory. He used the one about the shoemaker’s son. When his team started on their analytics journey, “it really made us feel like the shoemaker’s son who didn’t have shoes.” Nielsen had been busy undertaking analyses for its many clients, but never for itself. This post is based on “People Analytics: Breaking Myths with Agility and Passion,” presented at LinkedIn Talent Connect 2016.